It's been a while since I've been able to show a funky chunky 1970's model. I've had a lot of other models jump into my queue but I finally got around to a personal project that's been sitting on my bench for a while. It's a 1973 Auto Cal Delta. It was made for a single year. The Auto Cal Delta came with a yellow 14K gold electroplated case with a stainless steel back. The movement inside is an 820 grade with a quick change date complication. This means the date can be changed by pulling the crown out halfway between winding and setting. That makes changing the date much easier than earlier models where the date was changed by advancing to midnight, back a few hours and advancing again until the desired date was shown. I've had my project watch for a couple of months and I thought it would be a great before and after project to show. As received the crystal is terribly crazed and the case is a bit beat up. It's hard to see if the dial is in good shape or not. The case back is a bit scratched up too but it's engraved with a presentation to a man on this 50th birthday, presumably. That's a milestone I just celebrated as well. The date is from November 1972... how does a 1973 model get presented in 1972? Well, Hamilton introduced the next year's models in the Summer/Fall of the prior year, just like new cars do. 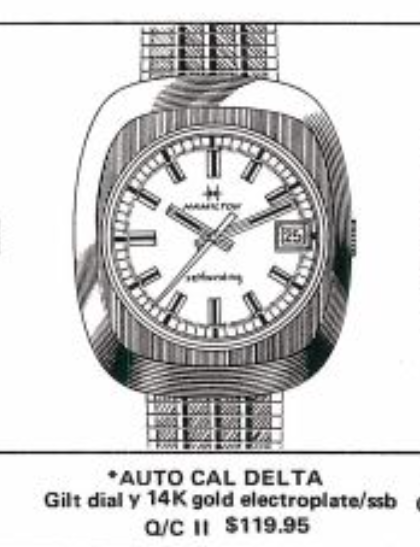 The Hamilton 820 is an ETA movement and looks very similar to today's modern Hamilton automatics. Once the movement is removed from the case, you can see the dial is in great shape. No amount of polishing will do this crystal any good. It will have to be replaced. While the parts are being cleaned I taped the brushed finish portions of the case so that I can polish the bright finished part on my polishing wheel. A new GS Evr-Tite crystal in 28.1mm with a yellow reflector ring will be perfect for this watch. Everything is cleaned and dried. Time to put it back together again. The basic movement is back to running condition. Hmm... it's running a little oddly but I don't see anything out of whack. My first step will be to run this past the demagnetizer to see if there's anything funny going on inside. A little tweaking gets the movement running cleanly. Now I just need to reassemble the rest of the movement and install it back in the case. Wow! What a difference a trip to the spa makes! This watch looks fantastic now. I rebrushed the top and sides and they now sparkle depending on how the light hits it. The bright polished edges still show some minor dings but overall the watch looks nice and shiny... it's running great too.